Congratulations you are getting married! After shouting it from the rooftop and sending out a quick picture of your engagement ring, one of the big ways to let everyone know that you are engaged is an Engagement Photo shoot! 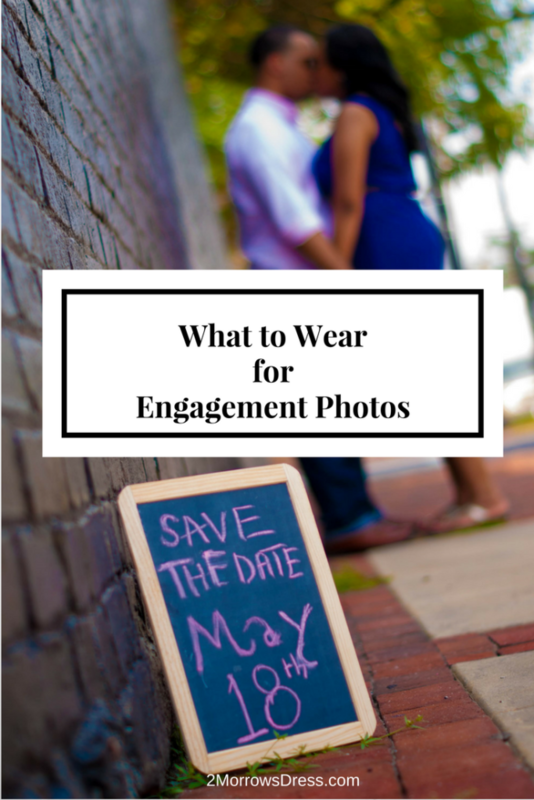 What should you wear for your engagement photo shoot? It depends on your location, weather (time of the year), and personality. There is no one size fits all outfit! Agree on how casual or formal the photo shoot will be. It will look silly if he is wearing jeans and you are wearing a silk evening gown! Avoid clashing colors or patterns for your outfits. 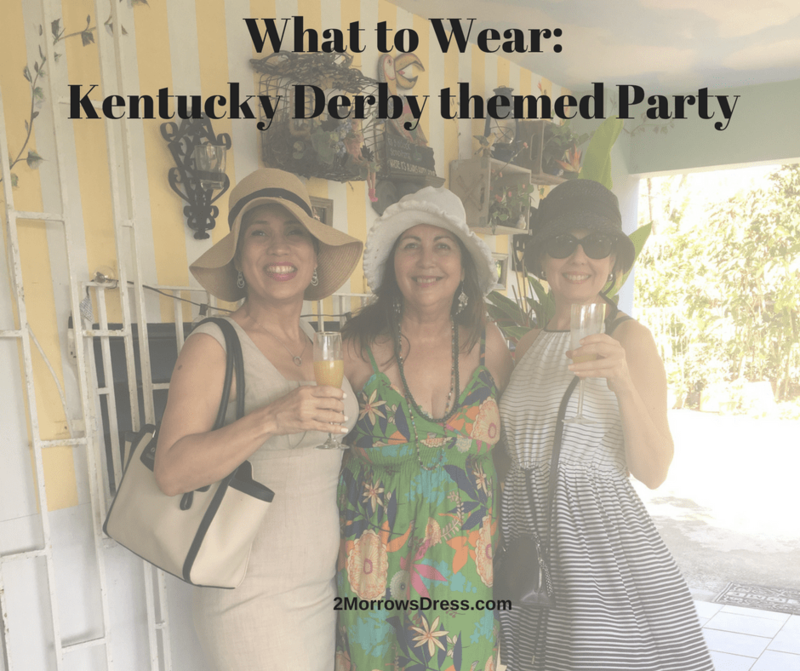 You do not have to wear matching outfits, stick to complimentary color schemes. Simple patterns and solid colors are timeless classics, so your photos will not feel outdated when you look back over the years. Make sure that you can comfortably move in your outfit, that you can sit, climb stairs (very likely), and wrap your arms around each other. Restrictive movements make for very stiff photos! Try on your complete outfit, including shoes and accessories the day before your photo shoot. Try a few different shoes to pick your favorite. Get your iron and press out any wrinkles. Even tee shirts and casual clothes should spend a few minutes in the dryer to eliminate any folds that will be exaggerated in photos. Bring a cardigan sweater or other laying piece for an instant outfit change during close-up photos. For outdoor photo shoots, consider bringing a pair of slip on flats. You may be walking across grass, climbing up rocks or steps, and walking around interesting (and slippery) water features. Bring a bag with a couple silly props or accessories for a few goofy photos. They might not make it in final photos, but it never hurts to a have some silly time during your photo shoot. This is your opportunity to get creative! The current trend is for more casual photos to show the “real” personalities of the couples. Here are just a few suggestions to get you started. Lisa from TheWeddingCat features her hometown as a striking backdrop for her photos. 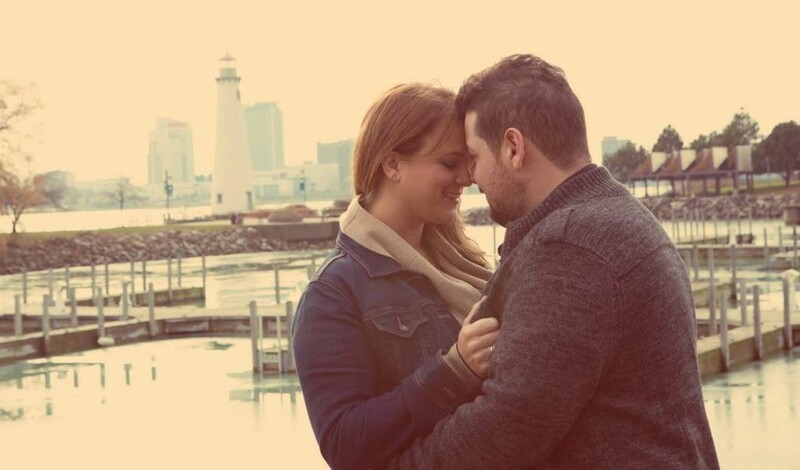 December in Downtown Detroit calls for warm clothes, and the effect is a cozy couple snuggling in each photo. The casual jean jacket and sweater are a simple statement and all eyes are on the happy couple. Krystal from Make Me Married choose this beautiful cobalt blue lace dress and her husband coordinates with a matching blue accent on his casually untucked dress shirt. Excellent capture from Forever Photography featuring Krystal’s bold, bright color dress that “pops” against the fountain. Bright colors pull the focus against muted nature shots. Maja from Mexatia traveled to Plitvice lakes, Croatia to showcase the couples’ love of travel. Timeless Photography perfectly captured a kiss through the trees. Sturdy shoes for both Maja and Jaime are a must for this wobbly wooden bridge over the lake! Theresa from Bridesmaids Confession had two sets of engagement photos. When the happy couple was less than thrilled with the first set, their *new* Wedding Photographer proved to be a much better fit during these engagement photos at Mingo Creek Park in Pennsylvania. Here are 20 questions to ask your photographer before booking your session. An excellent reminder that engagement photos can always have a do-over, but you only get one shot on your Wedding day. Work out any quirks with the photographer early on, speak up about what you want, and set clear expectations before the wedding. Naomi from DIY Blooms wore a simple cream lace dress to keep it casual with her husband’s navy tee shirt and jeans. The red heart shaped balloons are the whimsical touch for a casual, fun photo shoot! Victorina from Squirmy Feet and her (now) husband met as a result of their shared love of Dragon Boat racing. Both are part of team USA in the sport of dragon boating. 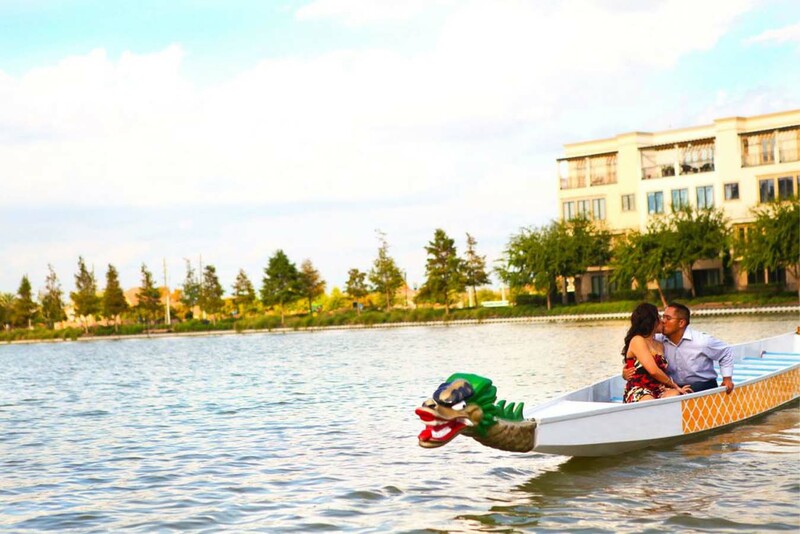 It was fitting to incorporate a colorful dragon boat in Sugar Land, Texas into their engagement photos. Follow their adventures on YouTube here! You’re right there are no wedding day picture do overs! 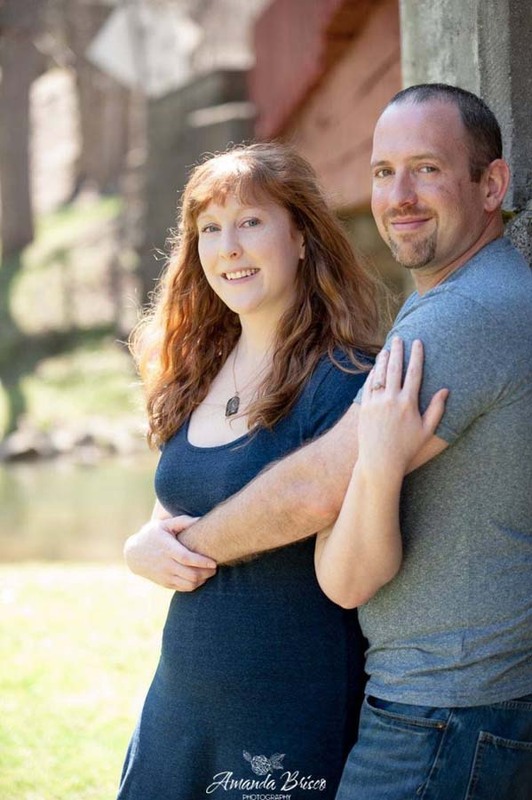 Having engagement photos prepares you for what it will be like to work with your photographer. It helps ease any tension you might have and show you what to expect. Great tips!!! Definitely sharing on pinterest! I haven’t seen myself to get married cause I’ve been single for quite a while. I like reading this at least it renders me an idea on what to wear during the engagement. You never know when you might meet someone, at least you know what to wear for photos! Enjoy the single years, they are still pretty great. These are great tips! My husband and I did our engagement photos last summer and it was so stressful picking out my clothes! I’m glad we were picky though, because we love our photos now. We did mismatched plaids, but they worked perfectly because they shared a similar color! Mismatched plaids sounds great! Did you use the photos as Save the Date, Reception Decor, or other ways? I did! We used them for our Save the Date and at the reception they were on our guest book table and gift table! This is something that I have never thought about but will certainly keep in mind for the future (even if it’s just solo photo shoots – these tips are great!). I am “awwwwwing” over all the couple photos. Love is in the air! Aren’t these couples just the cutest??!? 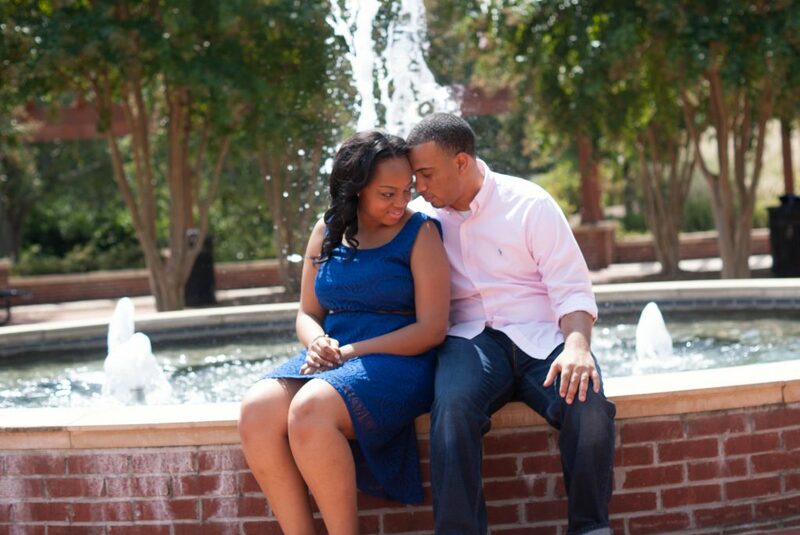 These are some great tips for engagement photos and I love your pics! Great tips! We didn’t end up organizing engagement photos when we became engaged, so I’m thinking we might stage a pretend shoot even though we’ve now been married for four years :D! Thanks! Glad you liked the tips. I think props can also break the ice with the photographer for more comfortable experience. Aww so many cute couple pics here! it’s very heart warming. I didn’t get an engagement photo shoot when I got married (many moons ago). I am going to have to do it all over again now I’ve read this post LOL! Seriously though, very sensible advice. Particularly number 1, after all if it’s going to work you’re going to need to get the communication right (and I don’t just mean for the photo shoot)! After writing this post, and seeing the happy couples, I am planning to do anniversary photos! Same advice, but skip the expensive wedding photographer, and just have a friend to photos. Great tips! I’ll share it on pinterest!! !